The F1 calendar's shift eastwards is by no means new or small-scale. 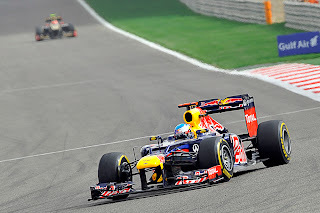 But even among the assorted new lands that the F1 circus has pitched in over recent years India must surely stand apart. This is because the round and its associated potential represents a massive opportunity for F1. To use terms that the sport's power brokers understand, India is a highly populous 'market', a point which is given particular focus by India's status as a coming force in the world economy. And if the race there can be made a long-term success, and furthermore if a genuine motor sports infrastructure can be established in India on the back of the F1 race, then the rewards will be considerable. Who can get close to Sebastian Vettel this weekend? As we know, F1's record in moving east is more a patchwork quilt than a magnificent canvas; some events have been more successful than others. The likes of the Turkey and China races started with fine crowds and much talk of building a national infrastructure, as India did last year on its debut, only for the attendant audience to dwindle over time just as the bold talk did. But there are some reasons to think India just might prove to be different. For one thing, unusually, the establishment of the race there is a bottom-up private enterprise by people with genuine motor sports passion rather than the standard rather top-down imposition by a government more concerned with national branding and boosting tourism. Also, there already exists a (nominally) Indian F1 team as well as a couple of Indian drivers in and around the sport, and who take more responsibility than most in F1 promotion. Various other initiatives in developing Indian drivers have also been mooted. Let's hope that this weekend's event is a continuation of setting the roots down. And the Buddh International Circuit facility is a fine one. In many ways it's typical Hermann Tilke (with all of the implications that carries), but many reckon it's his best effort in terms of layout, with plenty of quick challenging curves, including one loosely based on he mighty Turn 8 at Turkey, as well as many changes of gradient. Last year it provided very little overtaking on race day however; with the track presumably less dusty now than it was then we'll see this time whether that was a peculiar outcome or something which is fundamental to the layout. But whatever happens there will be plenty to divert the attention of the Indian fans, and of the rest of us, at Buddh this weekend. After the goings-on in Korea two weeks ago the consensus is that the title battle has narrowed to one for two players: form man Sebastian Vettel in his Red Bull versus previous long-time leader Fernando Alonso in his Ferrari. And of course many observers' eyes will be on those two in India. The big question of the weekend will be whether Ferrari can apply the brakes to the runaway Red Bull train. And if it can't, can anyone else? Auxiliary questions to this are, does Red Bull's recent strong form merely reflect that we have an F1 season going rather like a tennis match goes with service, with teams having a couple of strong races (as Red Bull has just had) as it introduces technical upgrades, only for another team to usurp it as it introduces upgrades of its own? Or does it reflect that, now that the brand of Pirelli tyres and rule changes for this year are better understood, that Red Bull's technical supremacy, held for a few years now, is now making itself felt? The answer to these questions will go a long way to deciding where title honours will end up this year. If it's the latter that's in the affirmative then it looks very good for Vettel. 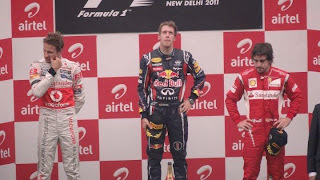 As things stand it has to be said that, barring the application of random chance, it's hard to see Sebastian Vettel and Red Bull being stopped in their quest for victory in India. This after all is a car/driver combination which has not been headed for so much as a single lap in a race for over a month. And the Buddh track shares a lot of the characteristics of that in Korea, part long straights and tight corners, part quicker stuff, and Vettel won as he liked at Yeongam. Indeed, he won as he liked in India last year. But to extend the tennis metaphor, the ball is now in Ferrari's court, and while it's now a break down having previously been ahead the match is by no means lost. Stefano Domenicali was correct to say that shaving even two tenths off lap times, on race day in any case, could be sufficient (indeed, Alonso finished only 14 seconds shy of Vettel in Korea). But what it absolutely must do is find this pace; if it doesn't then Fernando Alonso can only win the championship through luck. More encouraging for all concerned at Ferrari is that the team has started to sound more confident in recent days, claiming to be getting to the bottom of its correlation problems and vowing to be 'aggressive' with what it brings to the remaining races. But it can't afford to do any different. The most likely interloper into the Red Bull/Ferrari battle this weekend is McLaren. Although the championships now look like increasingly remote prospects for the Woking team the car's pace remains strong and indeed many observers thought that they could have been even quicker than the Red Bulls in Korea's race (we never got to see this pace though due to circumstance). And while it probably won't now win any titles this year it could well have a say in who does. 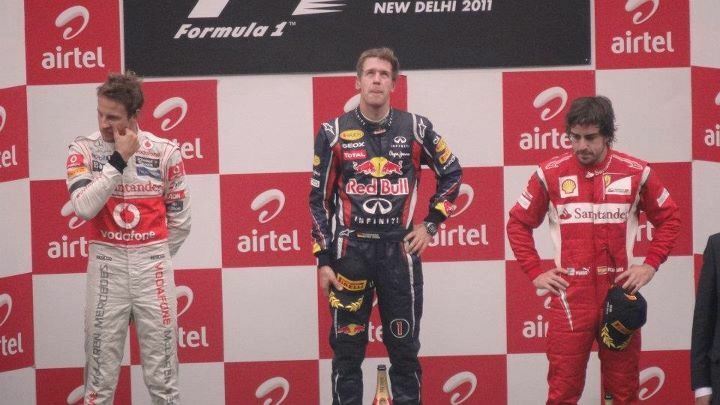 Indeed, if a McLaren or two gets between Vettel and Alonso in India it will give at the Scuderia a major headache. If Korea is any sort of guide, and India's legendary appetite for bureaucracy means getting new parts into India that weren't seen in Korea is going to be very difficult, then it seems few others will get among the 'big three' in India. 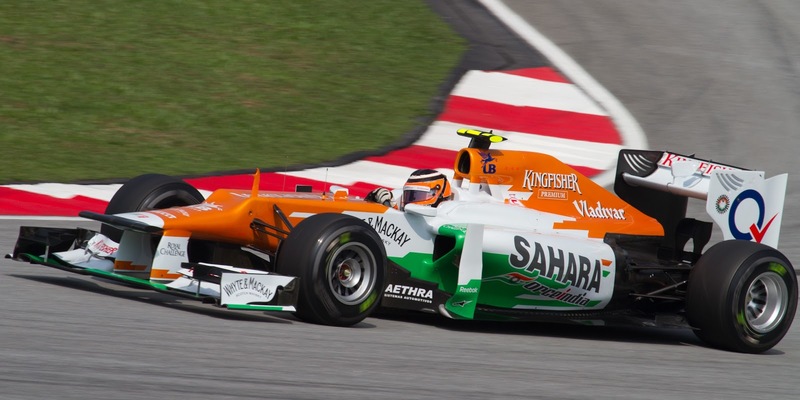 However, both Force India (the home team of course) and Toro Rosso have been climbers in recent races, and both did well around the Buddh track last year. Both teams are good shouts for points. Last year's race was also characterised by low tyre degradation, the surface is a smooth one and as last year Pirelli is bringing the soft and hard tyres, though the compounds are softer than then, and are the same as those used at similar tracks with abundant quick turns: Barcelona, Silverstone and Suzuka. But with all due respect much of the focus this weekend will be elsewhere. India should provide the latest set of clues for where the big prizes will go this year. Races are running out and things are getting critical.